I had half a red bell and half a green bell pepper left over in the fridge, so that's what I used. I was having a problem with my veganly beans this winter. I mean, my black beans with sweet potato and garlic are so good. I didn't even post my red beans though, they were so undistinguished. If you're wondering about the etymology of veganly beans, and I'm sure you are, they used to be called vaguely beans, as in "vaguely cuban" and "vaguely cajun," and all the recipes included meat. When I stopped cooking meat, I changed them to veganly beans and for the longest time I couldn't think how to make red beans and sausage taste really good without, you know, sausage. Truthfully also, my pinto and cannellini recipes are just okay. I mean, they're okay as soup. I have renamed them as such, reinvented recipes TK. But proper veganly beans I think should not be a thin soup, they should stick to your ribs. Tomato paste thickens the black beans, but you don't want everything to taste like tomato paste. What else to do. I solved the first problem by abandoning the vague idea of cajun for this recipe and really reaching for something umami. Everybody knows that mushrooms are umami, but did you know also tomatoes, spinach, asparagus, and corn are umami? So you can mix it up for your umami tooth, I picked cherry tomatoes for this. I went back to cajun to solve the second problem, I cooked a little roux in the middle of the recipe to thicken the broth. 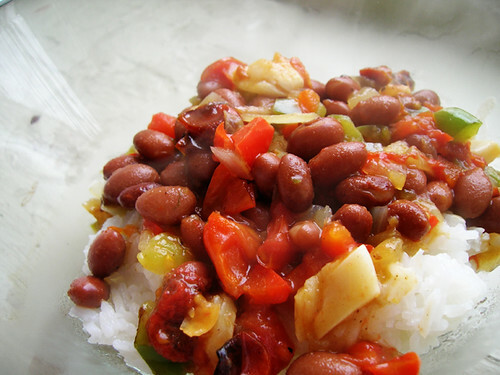 ETA: I usually eat veganly beans with rice; so before I start the beans, I put on a pot of rice. Heat oven to 500 degrees. Halve the cherry tomatoes. Separate the head of garlic into cloves, smash the cloves to peel them, and chop them into large pieces. Toss the tomatoes and garlic with olive oil, and a little bit of salt and pepper. Roast for about twenty minutes. Gently heat oil over low heat as you finely chop the onion, celery, and pepper, adding vegetables to the pan as they are chopped. Turn up the heat to medium high and saute aromatics until golden, about ten minutes. Stir in flour and cayenne and cook until well browned, about ten minutes or more. Add broth and cook a couple minutes more, then add beans, tomatoes, and garlic. Simmer until slightly thickened, about twenty minutes.